Your Softchoice Representative or Site Administrator can create and publish Quotes online. Quotes lock in pricing for a pre-determined amount of time (typically 15 days) and are available to purchase directly from your Dashboard. Conveniently access and purchase from Active Quotes directly from your Dashboard. A printable PDF version of your quote is available for download if needed. Download a PDF version of your quote to save or print. Can I purchase the same quote multiple times? Yes, once a quote has been published it can be ordered as often as needed until it expires. By default, the quote will expire after 15 days, but your Account rep can extend that date if needed. 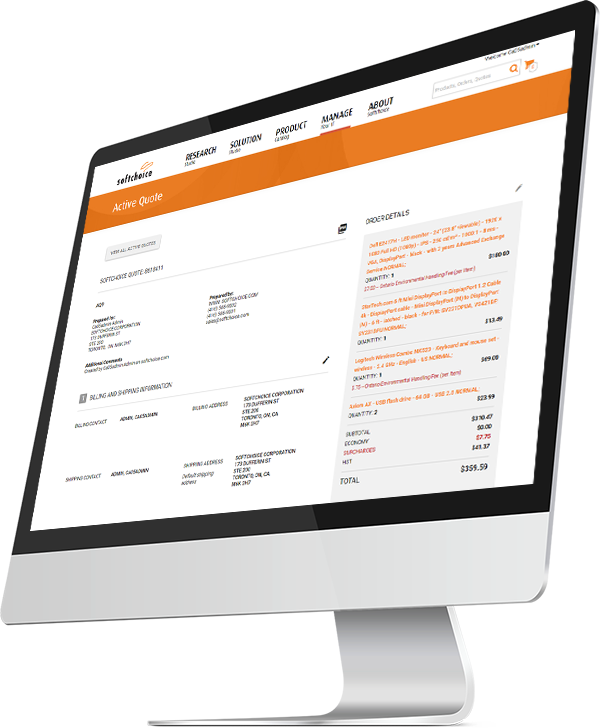 Clicking on the Order # or cart button will take you to the Quote Checkout page. From there, you can enter in either your credit card information or select to pay by Terms if your account is setup for that. Once the order has been placed you will receive an order notification and you can then track your order via the Order 360 tool. Can I edit a quote? Yes, you can edit a quote you created yourself. However, if a quote was created by your Softchoice sales representative, you cannot edit it. To enable Active Quotes or to learn more about this feature, fill out the form below. A member from our Sales team will reach out to you shortly.